Starting out at Punakha, this unique and challenging itinerary spends three days climbing the steep gorge leading to Laya before crossing the mighty Karakachu La to enter Lunana proper. After spending seven days walking through this 'paradise on earth', the route crosses the Gophu La to explore the valleys south of Gangkar Puensum, which remains the highest unclimbed peak on earth. Seven long days trekking remain to reach the wide-open fertile valleys of Bumthang. Probably one of the most challenging treks in the Himalaya. On landing at Paro you will be met by our representative. After Customs and Immigrations formalities, you will be escorted to the hotel. Start of Trek Day 1: Distance 17 kms and walking time 5-6 hours. 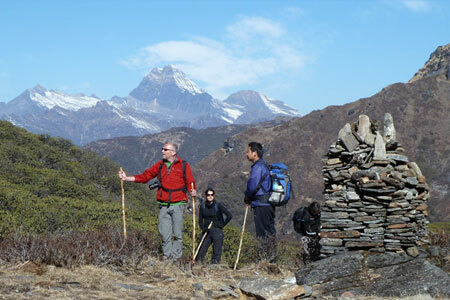 Starting at Drukgyel (2580m) and camp near Sharna Zampa (2870m). There is a gradual climb following the Paro river through the agriculture valley and villages. We camp opposite to the Gunyitsawa Army check post in a meadow. Trek Day 2 : Distance 22 kms and walking distance 6-7 hours. Starting at Thangthangka (3630m) and camp at Jangothang (4090m).Todays trial passes an army post and the village of Soe and a small settlement at Takethang. Yak herders live here. We camp beneath a ruined fortress at the base of Mt. Jumolhari. Trek Day 4: Acclimatization Day. You can spend the day relaxing or there are several day hikes to choose from. Two interesting hikes would be to get views of Mt.Jumolhari or Jichu Drake. If you are interested in a lake then you can take the hike to Tsophu. Overnight stay at the camp. Trek Day 5 : Distance 18 kms and walking time 5-6 hours. Starting at Jangothang (4090m) and camp at Lingshi (4010m) Today you encounter your first major pass at 4890m ( Nyile-la ).You also get snow peak views of Tserim Kang (6789m) Camp near a stream in a meadow. Trek Day 6 : Distance 10 km and walking time 5-6 hours. Starting at Lingshi ( 4010m). It is a pleasant walk and you encounter parts of Lingshi village and the settlement of Goyak. On reaching camp at Chebisa village you can visit the village houses. On this day we walk mostly through wild high pastures and yak pastures with few people and their herds of Yak. We also walk through the 'Gobula' pass at 4440m. Camp is above a tributary to the Mo Chu river. On the early part of the trek you will see views of Mt. Kang Bum (6526m) and Mt. Gangchenta (6840m). We pass by Tsheri Jathang, a valley by the river side where herds of Takin are normally seen during the summer months. Trek day 9 is a bit tough as we have to cross Sinche la (5005m) the highest altitude point on the trek. The second half of day's walk is through rocky trails and moraines. Limithang is in the Laya district and here you begin to see the wonderful children in funny hats. 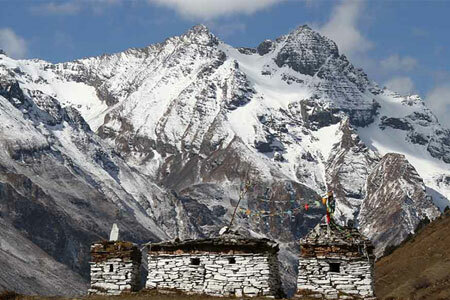 Camp at Limithang is beneath Gangchhenta; - the Great Tiger Mountain. If you have time it would be worthwhile to spend a rest and exploration day here. Today is all the way down hill along a winding river valley with quite a closed-in feeling. The trail splits, one going down with the river to the camp site used by the army while the other stays high and takes you into the west side of Laya village. We can camp on a flat table land above the east end of Laya village. Trek Day 12 : Distance 19km and walking time 6-7 hours. Starting at Laya (4160m), the trek starts with a gradual downhill walk and after an hour or so you start to climb again till we reach the camp site through conifer, maple and Rhododendron forest. Starting at Rodophu we start the trek with the trail leading uphill through dwarf Rhododendron bushes and cross a pass called Tsomola at 4780m. 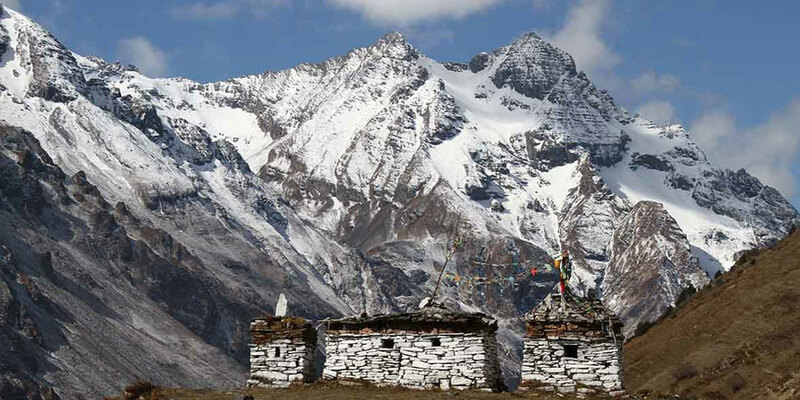 We camp at Narethang which is on a small plateau beneath the 6395 m peak of Gangla Karchung. Trek Day 14 : Distance 18km and walking time 18km and walking time 5-6 hours. Starting at Narethang we climb up to the Karchung la pass at 5120m and then down to glacial lakes which will also be our camping site. Starting at Tarina the day's walk leads through coniferous forest following the stream flowing from Tarina. It takes a two hour climb to reach the village of Woche. From here the Lunana area begins. Starting at Woche, todays trail leads via the Kechela pass at 4580m to the village of Thega where you stop for lunch and continue the journey till you reach the village of Lhedi. Starting at Lhedi we climb uphill following the main source of Pho-Chu river till you reach the Chozo village. Here we make a brief stop to explore the village and continue the journey to Thanza village placed below the snow capped peak of the Table Mountain locally known as Zonggophu Gang (7100m). Trek Day 18 : Visit village houses and interact with the locals Raphstreng Tsho with a packed lunch (round trip of 4-5 hours). We start early from Thanza to the base of Taze-la pass. Then trek to Jaze-la pass at 5050m and downhill until we reach the camp site. Trek Day 20 : Distance 14 km and walking time 4-5 hours. Trek Day 21 : Distance 18 km and about 5-6 hours. Starting from Jichu Dramo, we trek to Gang Rinchen-zoe la pass at 5140m and then its all the way down hill till you reach Chukarpo. Starting from Chukarpo its mostly downhill till Um Tsho (lake) 4230m. This is where a lot of religious treasures were discovered. The camp is is bit further at Thampe Tsho. Trek Day 23 : Distance 14 km and walking time 5 hours. Starting at Thampe Tsho, the day's trek starts with a couple of hours walk to the base of Tampela and then on to the Tampela pass at 4580m. From here the trek goes all the way down hill through Rhododendron bushes till you reach a yak pastures. Today is your last day of trek. The trail passes through bamboo thickets and fields following the Nikachu river and ends at the village of Sephu at 2500m by the Nikachu bridge. From here you can either drive to Trongsa (2hours) and then continue sightseeing of Trongsa and Bumthang , this will extend your itinerary by 3 more days or drive from Nikachu towards Thimphu. Night halt at Wangdue Phodrang. Morning rest or visit Chhimi Lhakhang in Punakha and sightseeing of Punakha town. Afternoon drive to Thimphu. After breakfast we visit the National Memorial Chorten, built in memory of the late King. We also visit the Handicraft Emporium/Chokey handicraft and the National Painting School. After lunch we shall visit Simtokha Dzong and explore Thimphu town. If the day falls on a Saturday or Sunday then visit the weekend market. Continue sightseeing of Thimphu and afternoon to Paro (2 hours). Day 30 Farewells and departure. 2) Sleeping tent (2man tent) with carpeted floor, Air Mattress, Pillow and room light. 3) Dining tent with dining set, Table, Chair and dining light. 4) Kitchen tent with kitchen set and light. 5) Hot water bag with cover. 6) Toilet tent with toilet pot. 7) Shower tent with shower bag and mat. 8) Aprons for cook and staff. Accommodation on 3 star hotels under twin sharing with breakfast. Lunch and Dinner in local restaurants and hotels. Experienced English Speaking Tour Guide licensed by Tourism Council of Bhutan. Private transport within Bhutan (Toyota coach / Tucson / Santafe / Land cruiser / Prado) as per itinerary. Museum & Monuments entrance fee. Bottled water during the tour. Travel & Tours Personal Care and Attention. Gratuities, bar bills, telephone bills, personal expenses, and laundry.